Front Line Assembly is the primary focus of Vancouver-based musician Bill Leeb. A founding member of Skinny Puppy, Leeb moved on to form FLA in 1986 with Michael Balch, releasing some cassettes (since released as Total Terror I & II) which paved the way for their 1987 releases: The Initial Command, State of Mind, and Corrosion. In late 1988, they recorded the mini-LP Disorder, since combined with Corrosion and released as Corroded Disorder. Their 1989 release, Gashed Senses and Crossfire, further cemented their popularity in the industrial scene, and prompted their first world tour. By 1990, Balch had departed and Rhys Fulber rounded out the duo, releasing Caustic Grip. But it was two years later when the duo released what for many has become the genre's crowning moment, the classic album Tactical Neural Implant, which to this day still defines the best of industrial music. Frontline Assembly enraged many of their fans in 1994 when they began to experiment with their established electronic-only sound. Millenium, with its heavy doses of live and sampled metal guitars, dared its audience to grow and expand with the band beyond industrial's perceived barriers. Front Line stepped to the firing line again in 1995 with Hard Wired, which reflected both a return to form and a continued embracing of the guitar. Hard Wired not only picked up where Implant left off, it improved on the sound by adding in elements of all of their side projects. A fall European tour was recorded for the 1996 release Live Wired, their first concert CD ever. Also in 1996, Front Line Assembly followed up Hard Wired with two CD singles, "Circuitry" and "Plasticity", and toured North America with Numb and Die Krupps. 1997 saw the first realignment of Front Line Assembly since 1990, with the departure of Rhys Fulber and the addition of Chris Peterson to the ranks. Front Line's 1998 album, FLAvor of the Weak, featured the band's first flirtation with electronica. Re- Wind, a twin CD of remixes, followed later that year. The duo then released Implode in 1999, and Epitaph in 2001. Epitaph exhibited building intros, trancy synth lines, pulsing beats, and solid melodies, which proved to be contagious anthems for a new future of industrial music. After the 2001 release of Epitaph, another changing of the FLA "guard" occurred: Chris Peterson left, and original member, Rhys Fulber (Fear Factory, Conjour One) returned. The newly charged Front Line Assembly delivered the highly anticipated Maniacal single in late 2003. The successful single laid the ground work for the 2004 album Civilization, and Vanished EP which featured three unreleased tracks. Then finally in 2005 came the event that everyone was waiting for, a Front Line Assembly fusion. Bill Leeb, Rhys Fulber, and Chris Peterson with new members Jeremy Inkel, Adrian White, and Jarod Slingerland began working on the 2006 album, Artificial Soldier. 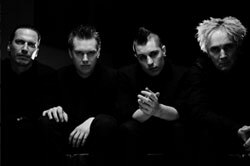 The newly re-formed line-up managed to create an album that no only lived up to the expectations of Front Line Assembly fans, but surpassed them. Heavy pounding beats, atmospheric strings, percolating melodies, dynamic synths and Bill Leeb’s trademark vocals couldn’t be fused together any tighter if you tried to do it at an atomic level. As if all of those factors weren’t enough, two guest vocalists appear on Artificial Soldier – Eskil Simonsson from Covenant (on "The Storm") and Jean-Luc De Meyer from Front 242 (on "Future Fail")! After the release of the album, the band embarked on a successful world tour, and released the remix album Fallout one year later. Bill's work can also be heard on a wide number of side projects, including Noise Unit, Delerium, InterMix, Cyberaktif, Equinox, and Synaesthesia. Bill has also contributed music to the popular video game, Quake 3 - The Arena.